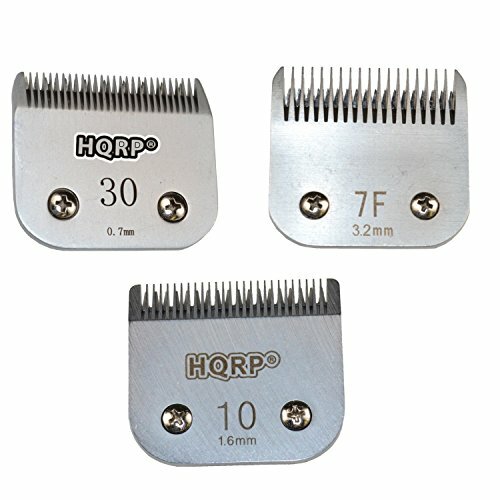 HQRP Blades will provide the perfect trimming for your pet. The blade Size-10 cuts hair down to 1/16" (1.6 mm), Size-30 - 1/35" ( 0.7 mm), Size-7F will leave the fur of 1/4 inch length (6.3mm). Sizes 10 / 30 - Used for clipping ears, pads of feet, face, throat, base of tail, under tail and for the removal of matts on dogs. Size 7FC (Finish cut) - use for body work. Works with Oster, Laube, Andis and Wahl detachable clippers; 100 days warranty!